SCRATCH SUPPER: WILTED DANDELION SALAD WITH PINE NUTS AND PARM | Jane Lear. Writing on Food and Travel. Young, tender dandelions are as green as spring itself. And their flavor, clean and sharp like the air at dawn, is what I crave now. Although the greens are found around the world today, their use in the kitchen developed a very long time ago in the Mediterranean. You can trace the name “dandelion,” in fact, from the Latin down through the French dent-de-lion, or “lion’s tooth.” This is no great surprise given the jagged shape of the leaves, but personally I have a fondness for the common French name, pissenlit, which reflects their purported diuretic properties. I’m just waiting to see the word on a sign at the Union Square Greenmarket. 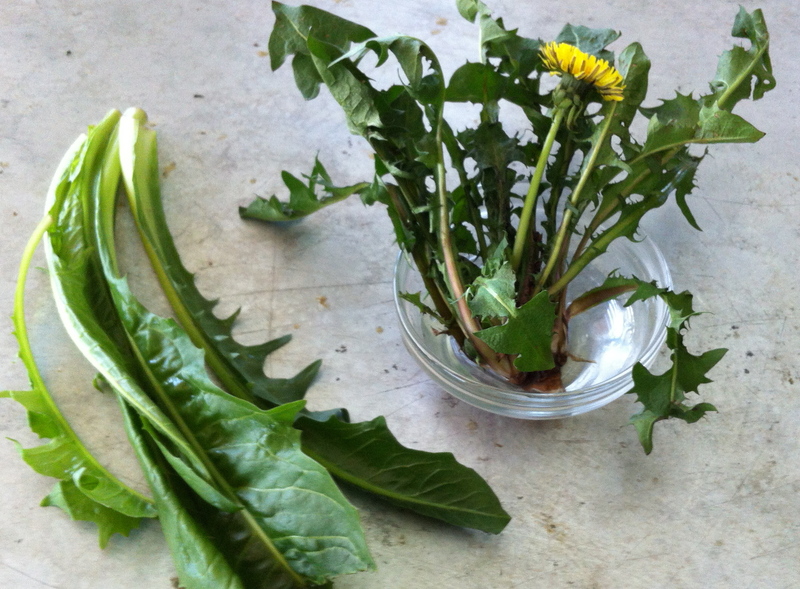 The best dandelion greens I’ve ever tasted were wild, taken from the long cool grass of an overgrown English orchard. The wild greens have intense flavor, but these days, I prefer them cultivated unless I know that the grass they’ve been plucked from is pesticide free. Whether wild or cultivated, however, there is a wide variation in the leaves among dandelion subspecies, and you’ll see two of them represented above. Okay, pay attention to this bit: The sprightly, swirly rosette on the right is an example of what you don’t want to buy. The fact that it has flowered* means that the leaves have turned from bracing in a spring tonic sort of way to very harsh and unpalatable. So when shopping for dandelions, make sure any buds you see are tiny and few. Although dandelion greens have a great affinity for a warm bacon dressing, last night I ransacked the refrigerator and freezer (twice) and came to the unsettling conclusion that we are sorely lacking in the pork department. I do not understand how this happened, but never mind: I found some pine nuts, and we made do. Garlic toasts and fried eggs rounded out things nicely. This salad thrives on improvisation. I’ve called for Sherry vinegar below because I like its sweetness with the assertive greens, but red-wine vinegar or balsamic would be fine. Try pecans or homemade croutons if you don’t have pine nuts. I could also see adding some dried cranberries, if I had some. By the way, Catalogna-type chicories (Cichorium intybus; often called dandelion chicories) can resemble true dandelions (Taraxacum officinale) and are often sold as such, especially at other times of the year. They are absolutely delicious and would work equally well here. 1. Tear the greens into generous bite-sized pieces and mound them in a large heatproof bowl. 2. Heat the oil in a small skillet over moderate heat until it’s hot and toast the pine nuts, stirring them often, until golden. Fish the pine nuts out of the skillet with a spoon and scatter them over the salad. Immediately drizzle the salad with the hot oil and toss to coat. Drizzle with vinegar and season with salt. Add the Parm and toss once more. Serve right away. * The next time you look at your lawn studded with a bumper crop of dandelion flowers and groan, remember that they are a fabulous source of pollen and nectar for almost a hundred insects, including bees. Dismay will turn to a virtuous glow in a split second. Posted: April 24th, 2012 under recipes, scratch supper, spring, Union Square Greenmarket. Going to have to try this. Sounds great. Oh and by the way, a folklore/etymology note my Cincinnati grandmother called dandelions “piss-a-beds” which is a literal translation of the French common name…although she was completely Bohemian. We love bacon dressing on spinach so I am excited to try it and this recipe on dandelion greens. My 3 year old daughter loves to pick those flowers so it will be fun to take her to the farmers market and show her something else that you can do with those dandelion plants.